Phew, just as well the Hollywood writer's strike is over. I was finding it really hard to write for fear of being called a "strikebreaker!" I hate upsetting my peers from the Academy, they're a delicate breed. Celebrating with a quiet flute of bubbly, I watched the Oscars last night and realised that every year I watch mainly because I love the bit where they dim the lights and fire up that good old PowerPoint presentation of dead Hollywood people. If the Oscars are all about your measure of worth in the entertainment industry, then the annual three minute Oscar clip-fest memorialising dead stars is the ultimate test for who we love best. (And if your footage gets slow motion treatment you've really tugged at our heartstrings). In November 2006 Artswipe wrote a tribute for Adrienne Shelley who achieved arthouse cinema fame for acting and directing in her brief lifetime. On Oscar night last year Shelley was not honoured in the death montage. What a crime against cinema. 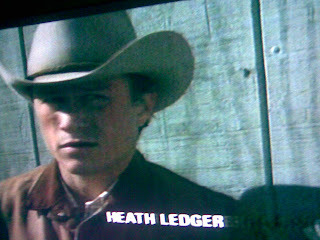 With this in mind, I was looking forward to the Oscars this year to see how big Heath Ledger's applause would be and whether young actor Brad Renfro (Apt Pupil, Bully, The Client), who died of a heroin overdose a week before Ledger, would get his moment of Oscar hagiography. Much like I anticipated, Renfro was excluded. Since the Oscars were televised the global press has been buzzing with news of Renfro's "Oscar snub". Once you would have expected such a headline to be reserved for that illustrious actor who was cheated out of a much deserved nomination (say Matthew McConaughey for his performance in Fools Gold or Mandy Moore for Because I Said So). As for Ledger, he was honoured last in the presentation and the applause was deafening. If they had cut back to the audience you would have seen a pre-ad break standing ovation that after a few heartfelt minutes would subside for the bit in the night where an animated character presents an award.